Product #60746 | SKU ESR-T13A-19-AB | 0.0 (no ratings yet) Thanks for your rating! It provides a high-quality aluminium, CNC-milled protective armour for your camera that has several ¼”-20 and ⅜”-16 mounting points. Arm your camera with this Tilta Camera Cage with Gold Mount Battery Plate and 19mm Baseplate specifically designed for the Sony Venice. 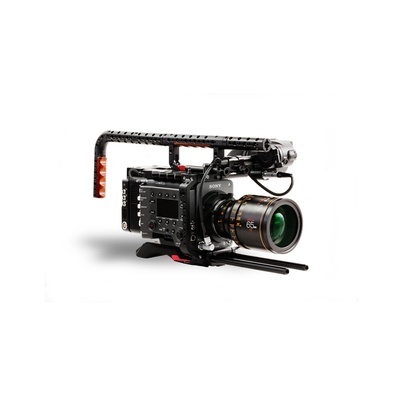 It provides a high-quality aluminium, CNC-milled protective armour for your camera that has several ¼”-20 and ⅜”-16 mounting points for attaching accessories. The Tilta Battery Plate for Sony Venice integrates with the top plate to provide several power outputs. Two versions of the battery plate are available: one where the ports face to the side of the camera (ideal for if you own the AXS-R7 recorder and have it attached to the camera) and one where the ports are set at a 45-degree angle (ideal for if you don’t have the AXS-R7 recorder attached so that the ports don’t interfere with the ports on the back of the Venice camera). Pins on the battery plate directly communicate with the top plate when attached which transfers power output functionality to it. This allows you to power your accessories from virtually anywhere on the cage.